More than $30 million in new federal funding will support infrastructure improvements projects in Virginia Beach. 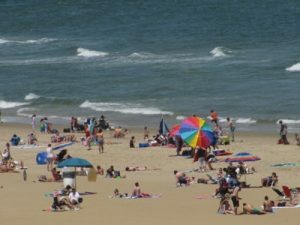 The City of Virginia Beach and the Army Corps of Engineers have a partnership agreement for pumping sand from the ocean back onto the resort beach (called re-nourishing) on an as-needed basis. The funding award will provide for the maintenance of a high, wide beach that, in combination with the Boardwalk and seawall, protects the resort from significant damage during severe coastal storms. The sand at the resort beach was last replenished in 2013 using money Congress provided for Hurricane Sandy relief. The Lynnhaven River project is a partnership between the U.S. Army Corps of Engineers and the City of Virginia Beach that will restore water resources in the Lynnhaven River basin. Collectively, these restoration efforts will enhance habitat and water quality in the basin. The initial award funds $10 million for the first phase of the projected $34 million project, which includes restoring oyster reefs, wetlands and submerged aquatic vegetation. Dredging the Lynnhaven and Rudee Inlets will ensure boats can safely travel both waterways. Baltimore and Norfolk harbor pilots travel through the Lynnhaven Inlet, and both commercial ships and private boats access the Atlantic Ocean through the Rudee Inlet. Making the waterways more navigable will also support Navy training exercises. Recently, U.S. Sens. Mark R. Warner and Tim Kaine announced $55.985 million in new federal funding for infrastructure improvements throughout Southeastern Virginia and Richmond. More than half of that money will be spent around Virginia Beach to support four projects already included in the U.S. Army Corps of Engineers’ approved work plan.